Recruiting will never be the same thanks to virtual reality and other immersive technologies. It is safe to say that virtual reality has become a part of many industries and business fields by now. However, we are not fully aware of how deeply it has entered the fabric of our professional lives. For instance, can you think of any application of virtual reality in staff recruitment? None whatsoever? 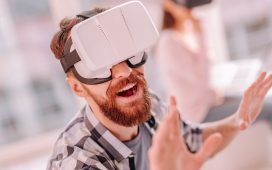 In this case you would be surprised to know that both recruitment companies and in-house HR specialists are already using virtual reality experiences to test and select job candidates and to create a comprehensive presentation of the workplace. Attracting top talent is a continuous challenge for HR professionals. Top candidates need strong incentives, one of these being the guarantee that they will become a part of a modern and innovative company, with a solid business culture oriented towards new technologies and real opportunities for personal growth. How do you give a candidate this assurance? First of all, you need to have them face to face to explain to them the benefits of working for the company. But to do so, your job ad and recruitment process must be challenging enough to motivate them to apply. Jaguar Land Rover is a large car manufacturing corporation in constant need of electronics and software engineering specialists. In order to attract the best possible candidates, the company has created a unique recruitment experience in collaboration with the band Gorillaz. The candidates enter the mixed reality setting of Gorillaz’ actual house, and are free to explore iconic cars made by Jaguar Land Rover in the garage. Then, they must use their code-breaking skills to solve a series of puzzles. The successful candidates are moved one step further up the recruitment process. The Commonwealth Bank of Australia has decided to create an immersive virtual reality world where job candidates can experience daily work and its various challenges. This virtual reality experience helps potential candidates understand the skills and level of experience they need to make a good fit. This is also helpful for human resources specialists, because some of the people who experience the virtual reality workplace demands in this manner will opt out of applying to a job they feel unprepared to handle properly. In this manner, both candidates and HR specialists save valuable time. Apart from the company culture, the actual workplace has a strong impact on an employee’s capacity to adapt and perform at their highest potential. Most companies offer candidates a quick tour of the offices and facilities, but this is nowhere enough to get a clear picture of the work dynamics. General Mills has decided to create a virtual reality rendering of their headquarters which can be explored by candidates at their own pace using the Oculus Rift headset. This tour allows potential job candidates assess whether they would enjoy working there even before applying for a position. No workplace is more dangerous than the military. In order to make sure that its recruits are a perfect fit for the job, the British Army uses a virtual reality simulator which places the candidates in real life combat situations and training drills. All these applications of virtual reality in recruitment represent a benefit both for candidates and for HR professionals. Having the ability to experience the actual job duties and work environment helps candidates assess their own willingness to join a company, while recruitment specialists can get a first-hand idea of how well a candidate can perform in certain situations.